The moral of the ‘Beauty and the Beast’ film is that desirability shouldn’t be judged based on appearance. If anything the action platform game based on this movie carries the opposite message. According to the Time Out film website, one in three people will pick ‘Beauty and the Beast’ when asked to name a Disney film. Maybe that’s because the 2017 live action remake has reminded everyone just how magical the original 1991 animated film was. Perhaps it’s because the movie became Disney’s first animated film to be adapted into a Broadway musical in 1994. There’s a chance many remember it because ‘Beauty and he Beast’ was the first animated film to be nominated for the Best Picture academy award. Though most likely, people simply pick ‘Beauty and the Beast’ as their most memorable Disney film because it’s superb. Reviews from 101 critics average 93% and it represented the peak of the nineties’ animation renaissance; taking nearly half a billion dollars at the box office. remain, as the beast hopes that one day she will love him as that would break his curse. With this being an optimistic romantic film, naturally the beauty sees kindness within the beast and with the help of a castle full of enchanted characters the pair fall in love. While Beast maybe a furious imposing mix of man and lion, the film shows us that Gaston, a heavily armed muscular man can defeat him. However even this former war hero can only best-the-beast after a mighty struggle across roof tops then unfairly striking from behind. 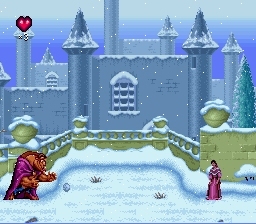 While the ‘Beauty and the Beast’ game attempts to follow the film’s story there is one significant difference: Beast may look a lot like his cinematic counterpart (with a wonderfully detailed sprite) but he is hilariously weak, a cumbersome oaf who lacks the agility seen in the film’s exciting final scenes. 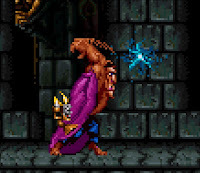 “The beast is a slow moving lumbering sort of character who’s only offensive move is a swipe with his massive hairy hand” notes Nintendo Power magazine. 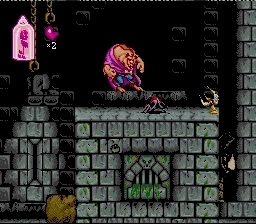 The main character of the game would not fare well against the angry mob or vicious wolves seen in the movie, given that he can be killed by brushing against a bat or being bitten by a House-spider. “You main priority is trying to fight off all manner of dreamlike out of context foes” observes critic James Leach. Fans of the shooter genre are well aware of “bullet hell” games; where a constant bombardment from enemies presents a huge challenge to the player. ‘Beauty and the Beast’ is the closest I’ve come to finding a bullet hell platformer. Because your playable character is so weak and moves so slowly, without advance knowledge of enemy placement you simply won’t stay alive. “Sure it looks great but it’s slo-o-ow and can get ridiculously frustrating” noted Super Play Magazine. It gets to the point where you must pre-emptively react to every level foe as Beast’s claw swing literally takes two seconds to do damage. To get any enjoyment from playing ‘Beauty and the Beast’ I had to use a cheat that made the beast invincible. I was simply fed up with getting taken down by fast moving level enemies that I couldn’t see until they were right in front of me and by then it was obviously too late to react without taking damage. You feel compelled to inch through the stages so you can continually check for potential threats but the game makes this impossible. The beast’s rose at the top of the screen acts as a level timer and if you take too long you’ll find yet another way this frail monster can be easily killed. they have taken ideas from the film and run with them. For example, playful scenes in the film shows Belle throw a snowball at Beast which he shrugs off without any injury. In the game this translates into an awful section where the player must guide the beast to a precise pixel perfect position to catch the snowballs. It’s something that can only be achieved if a button is pressed at an exact time and a total of twenty seven snowballs must be caught to progress to the next stage. Missing more than three costs Beast a life. It’s a level that should be at most a mini game, not a difficulty spike that stops a player in their tracks. Worse still, it’s not the only illogical choice the game designers have made. While it may not make any physical sense, generally most games allow a player some degree of control after initiating a jump. Typically you can alter the direction of your character mid flight, fine tuning their landing. This Super Nintendo game doesn't really allow this. Throughout the game, I couldn't seem to course correct. It’s a minor irritation that makes small jumps across ledges harder than they need to be, but it’s larger jumps that pose the biggest problem in ‘Beauty and the Beast’. Like an Olympic long jumper, unless you build up momentum with a run up, you simply can’t make jumps of a great distance. Obviously the further you get into the game the more jumps you have to do, and before long the player is expected to string multiple jumps together. Stopping removes the required momentum and without it The Beast doesn’t cover the desired distance. If you became frustrated and enraged by the snowball fight level you’d best not play the Library stage. This awful part of the game will surely have even the most placid gamer throwing their controller in a furious rage that would shame even the beast. 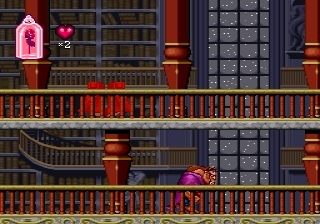 It’s a part of the game that doesn’t really exist in the film, where Beast inexplicably has to jump between many vanishing books upon a bookshelf. If you mis-time a single jump in a chain you have to start from the beginning of the level. Unlike games like ‘Mega Man’ where vanishing blocks follow a pattern, the books in ‘Beauty and the Beast’ seem to appear and disappear randomly. Many are even off screen when you start your jump, meaning success in this penultimate level is undeniably down to chance. “It’s clumsy, pedantic and too often you find yourself relying on leaps of faith to reach platforms” James Leach claimed in his review. “Survival is a question of luck rather than skill”. Impressive videos on YouTube show players completing the stage in less than a minute but after an hour of playing I still couldn’t get further than half way through the stage. To make things worse, I stared at my thumb and was shocked to see an imprint of the DPad where I had been pressing so hard on the controller that I had actually caused literal injury. “Okay so it’s quite a challenge but for all the wrong reasons” agreed James Leach. “The challenge is to see if you can stay alive for more than 30 Seconds rather than a cunning problem [to] solve. What a disappointment”. To fall back on an obvious cliché, this game may be a beast to play but it’s still a beauty to look at. “Graphically ‘BATB’ is a stunner” notes Super Play Magazine. 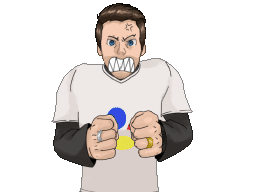 “The sprites are all detailed and the animation of Beast is particularly impressive. He leaps, roars, climbs, hangs and fights beautifully and easily rivals ‘Aladdin’ as a spectator pleaser”. The magazine was also impressed with the game's dark gothic environments. “The backgrounds are totally in keeping with the film and utilise parallax scrolling to good effect.” According to Nintendo Magazine System, ‘Beauty and the Beast’ “contains some of the best backdrops the Super Nintendo has seen for ages”. It’s nice that so many minor characters have been included too, although as Nintendo Power points out “other characters from the movie show up albeit in cameo roles. You’ll see most of these familiar faces only between acts”. 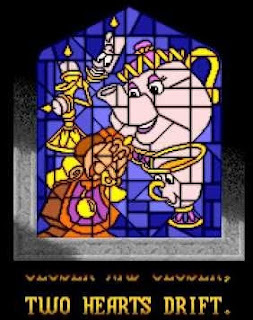 Cogsworth, Chip and Mrs Potts are represented in pixel form in continue and point-total screens. Meanwhile Lumiere and Lafou appear in the first and final level respectively. The former acts as a guide through the opening stage while the later shoots at you while you try to kill Gaston in the game’s closing moments. Super Play however felt their inclusion was simply there to please the fans. “You can’t help feeling that these are merely gestures nodding a wink of recognition to the film rather than making the game an extension of the film as was the case with ‘Aladdin’”. The release date for the game is somewhat surprising. Hitting the shelves some three years after ‘Beauty and the Beast’ was in the cinema, clearly the game was not made in a rush to coincide with a fixed cinematic or VHS release date. The fact that Hudson Soft also released a similar version of the game on the NES suggests it was in development for some time, as by late 1994 very few people (in Europe at least) were playing 8bit games. ‘Beauty and the Beast’ wasn’t even available in Europe until February 23rd 1995 and by this point there were four other completely different games based on the film to be played on rival system. 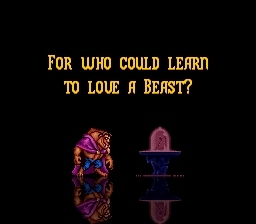 Despite the SNES game’s short comings, it still remains the best video game to be inspired by the original ‘Beauty and the Beast’ film. Sadly while ‘Aladdin’ got two superb but different games, ‘Beauty and the Beast’ didn’t get a title on any system that does justice to the source material. There are fun moments to be had playing this SNES game but there’s many many more times when the game is just so frustrating you’ll wonder why you continue to play. Despite my very best efforts I could only see the later stages of the game by skipping the Snow Ball stage and applying an infinite energy action-replay code. This of course removed any challenge but even that didn’t dampen the relief I felt when I saw the game’s ending credits. While the ‘Beauty and the Beast’ film is remembered by so many, I imagine people will remember the Super Nintendo game for the wrong reasons. Attractive yes, but brutally hard, un-necessarily unfair, cruelly cheap and, more often than not, a lumbering slog. No one would question my love of Disney, and I consider ‘Beauty and the Beast’ to be a masterpiece. The film teaches us to see the beauty that exists beneath the unpleasant, but if I struggle to see the good in this game I am left wondering who could ever love this Beast? One of my closest friends sent me ‘Beauty and the Beast’ for Christmas knowing full well it would test my patience. Apparently this game turned her into the gamer she is now and playing would make me understand her better. Meanwhile I’m just delighted to be one step closer to owning every 16bit Disney game. However, I wonder how much I would have played if this game didn’t feature a Disney princess that I have a crush on - even if her presence made me hate snowballs!